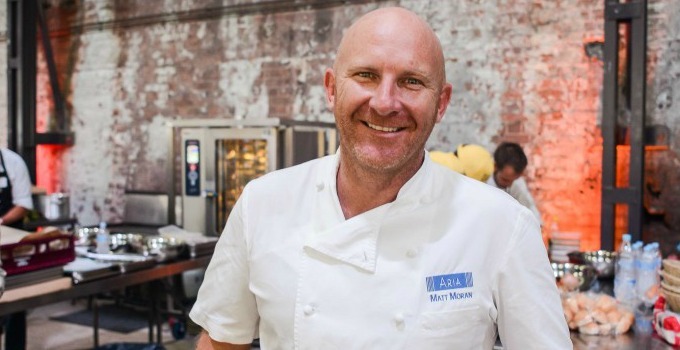 Aussie chef and restaurateur Matt Moran is known for being one of the best in the biz. And in recent years he shot to household-name status, thanks to his impressive TV career – hosting his own show Paddock to Plate and judging on MasterChef and The Great Australian Bake Off. We recently got the opportunity to chat with him about all things food: the goss on what’s happening at Aria, Brisbane’s evolving dining scene, and his favourite dishes to cook at home. What inspired your love of food? To be honest, I didn’t really know I h d this much passion for food until I fell into it and I’m so glad that I did. I just hated school and wanted a way out but from the minute I walked into a commercial kitchen, I completely fell in love with it. Also, as a kid I grew up on a farm and looking back I’m sure it influenced my love of food and farming in some way, I just didn’t recognize it at the time. If you were a fruit/vegetable, what would you be and why? Tough question for a chef! I don’t know, maybe a banana because once you peel back the skin you never know what you’ll be surprised with. What do you love about fine dining (other than the food)? The overall experience. First and foremost the food has to be great of course, but it’s about so much more than that. With fine dining, the restaurant really is the sum of its parts. It’s great food, incredible service, a good location and views, fantastic wine list, a comfortable chair, acoustics, good lighting… It’s the total package you get with a fine dining experience. And that’s something that Aria has done well. It’s important to have all of those things done right. Why do you think that Brisbane is seeing a hop, skip and bite back towards fine dining? The Brisbane dining scene is constantly evolving and it’s come in leaps and bounds over the years. It’s definitely shifted up a gear and it just keeps on getting better. The people in Brisbane too, are really engaged with food and the industry. And fine dining will always have its place in the market whether it’s for a special occasion, celebration, event or business meeting. What new tasty dishes and flavours can we expect from Aria for this new season? We’ve basically pared everything back a bit to keep the menu more in tune with Aria Sydney. We haven’t gone down a level at all, the focus is more about letting the ingredients really shine and speak for themselves. Seasonality and using local produce wherever possible is something that’s always at the heart of what we do. And it’s great to see that there are more and more producers and farmers that are really dedicated up here. We’ve got some great product. Why is quality, seasonal produce so important to Aria? It’s absolutely key, it’s the foundation. At the end of the day, us chefs are only as good as the ingredients we work with so we need to start by using the best possible product we can find. And that’s why our farmers and producers are so important too, they’re the backbone of it all. Gone are the days of sourcing produce from overseas like we did when I first began my career – that’s just the way it was back then. We have some of the world’s best produce at our doorstep and we should be using it. We should eat what’s in season and buy locally where we can. It just tastes that much better as well. If we took a peek in your fridge, what would we find? Cooking at home is one of my favourite places to cook but I tend to buy produce as I go and play it by ear, depending on what I feel like eating. You might find some leftovers from the night before for the kids to eat, as I hate wasting food! Maybe some eggs from my farm. And I will always have some top quality butter. Same as everyone else’s… binge watching Game of Thrones. I’m eagerly awaiting the next season. What’s your go-to quick, throw together dinner at home? My poached chicken in master stock is often requested and always a winner! Where would we find you when you’re not in the kitchen? At my family farm, hanging out with my kids or riding my Ducati.